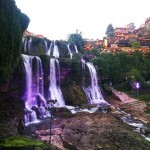 This rail journey is a great and classic travel route for lots of foreign travelers. 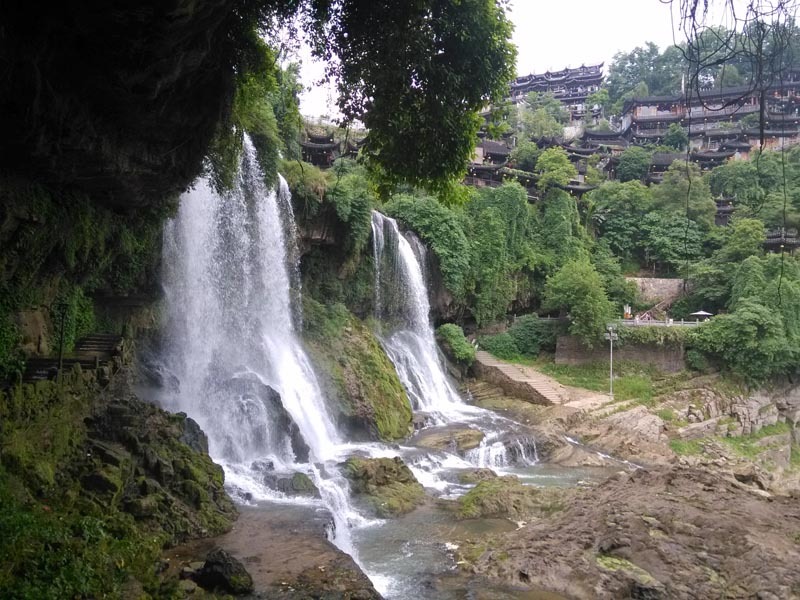 Along this route, you can go biking in the countryside of Yangshuo, see kast landscapes in Guilin, and visit the charming Fenghuang Old Town, see waterfall in Furong Town, and finally visit the national forest parks in Zhangjiajie. 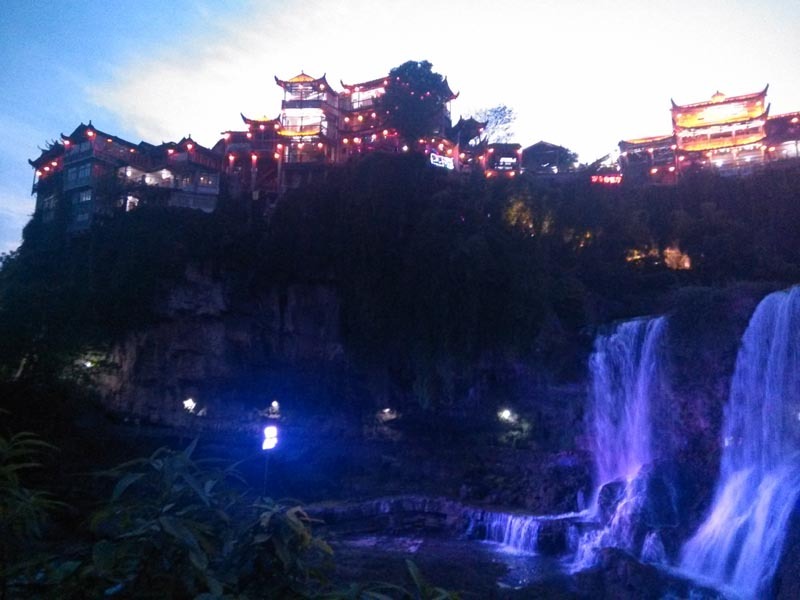 First, take a high speed train from Guilin Railway Station to Liuzhou Railway Station first, then change to Liujiang Railway Station (柳江站) by taxi (CNY 20-30, 15-20 minutes), where to catch night trains from Liujiang to Jishou (3 daily, from CNY133 for a hard sleeper, 8.5 – 9.5 hours). 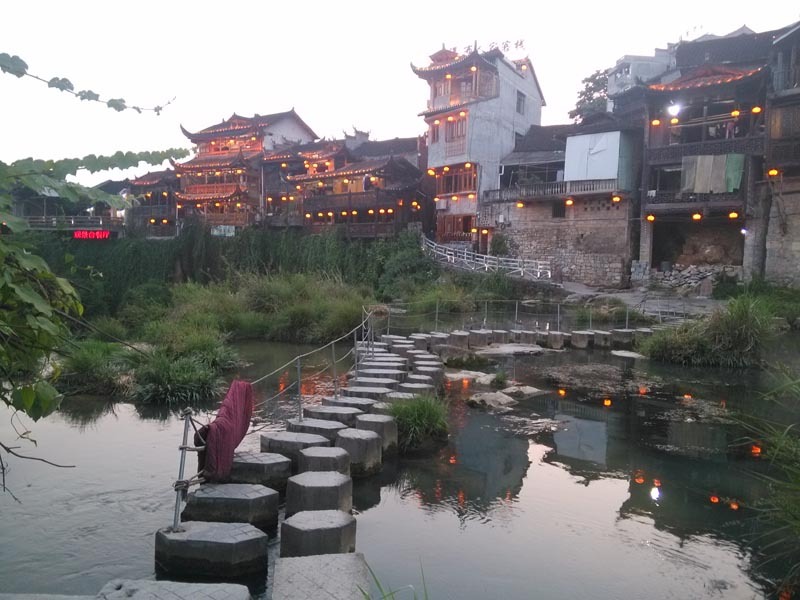 After reaching at Jishou train station, just walk out of the station and turn left to walk about 50 – 100 meters to Jishou North Bus Station (Jishou Bei Keyunzhan, 吉首汽车北站), where to catch a bus to Fenghuang. 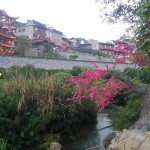 The buses from Jishou to Fenghuang run frequently and cost CNY26, journey time 1 – 1.5 hours. 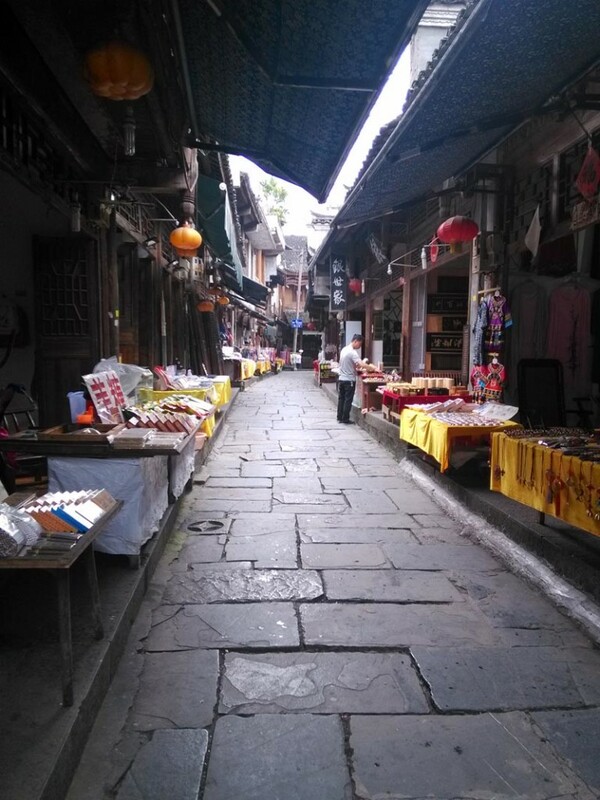 It stops at Fenghuang North Bus Station (凤凰汽车北站), where you still need to change to the public bus 1 to get to Fenghuang Old Town. 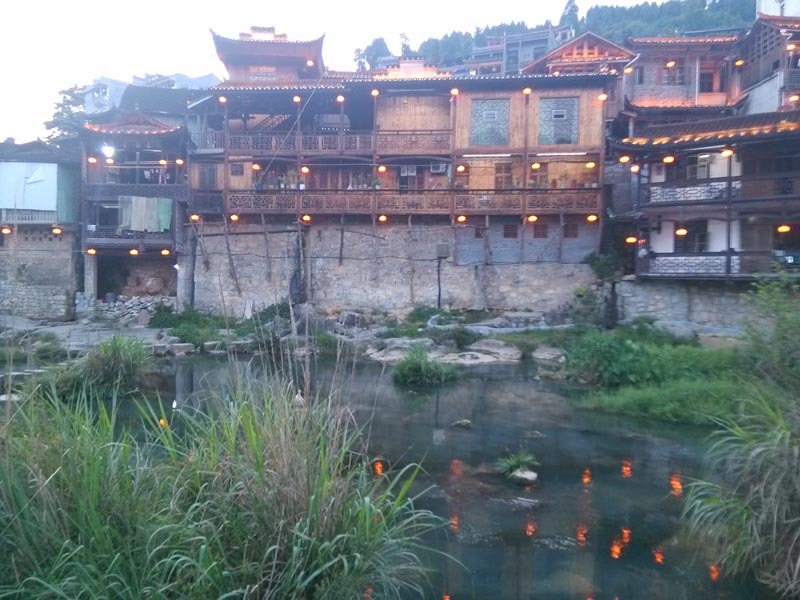 You can also go from Guilin to Fenghuang via Sanjiang & Jishou. 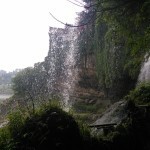 But the disadvantage on this route is that there are only one daily night train from Sanjiang to Jishou, departing at mid-night at 00:17 from Sanjiang County Station, which is far from its Sanjiang South Railway Station for high speed trains. After reaching at Jishou, just do as the option 1 explained above. 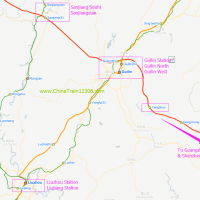 Guilin has three train stations for passenger service: Guilin Railway Station, Guilin North Railway Station and Guilin West Railway Station. 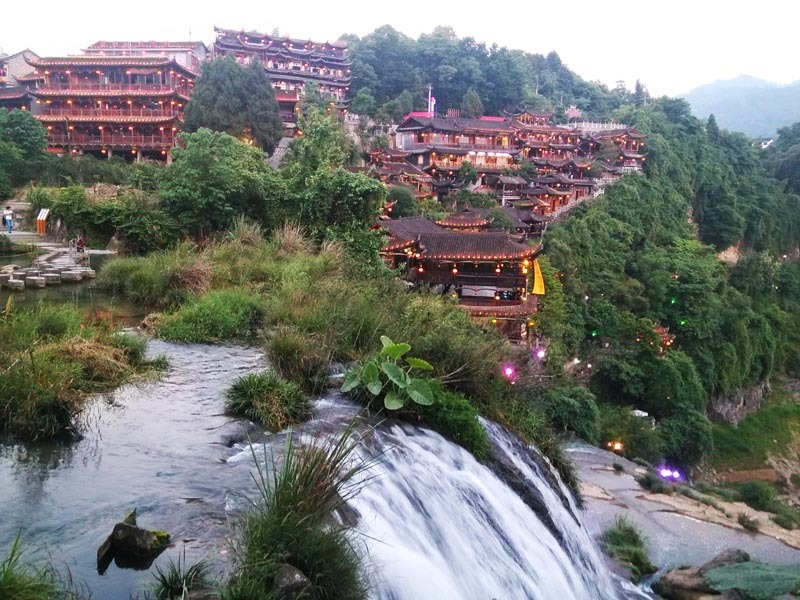 If you start your journey from Guilin or Yangshuo to travel to Fenghuang and Zhangjiajie, you will have to make a transfer by bullet train at Liuzhou City or Sanjiang County, where to catch the night train to Jishou (for Fenghuang) or Zhangjiajie. 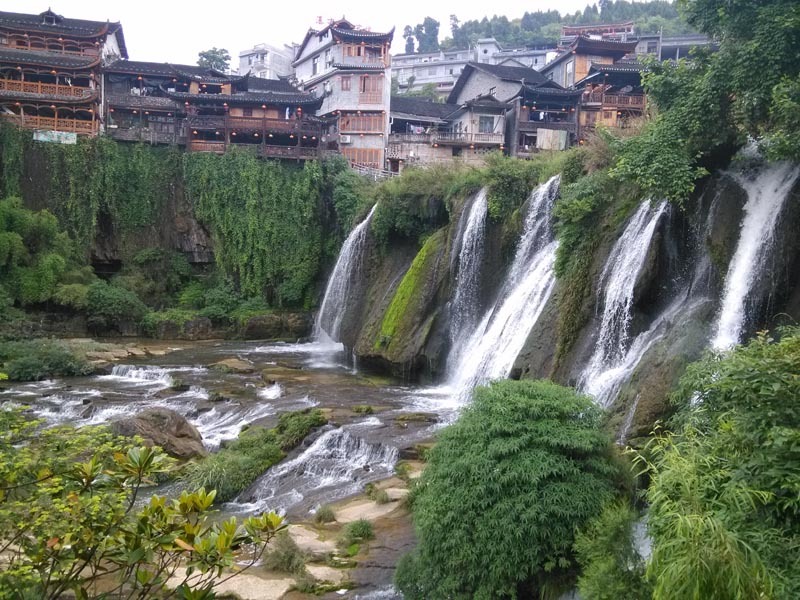 High speed trains run frequently from Guilin to Liuzhou with 40 daily departures from Guilin Railway Station, and 8 departures from Guilin North Railway Station. All of the high speed trains stop at Liuzhou Railway Station. 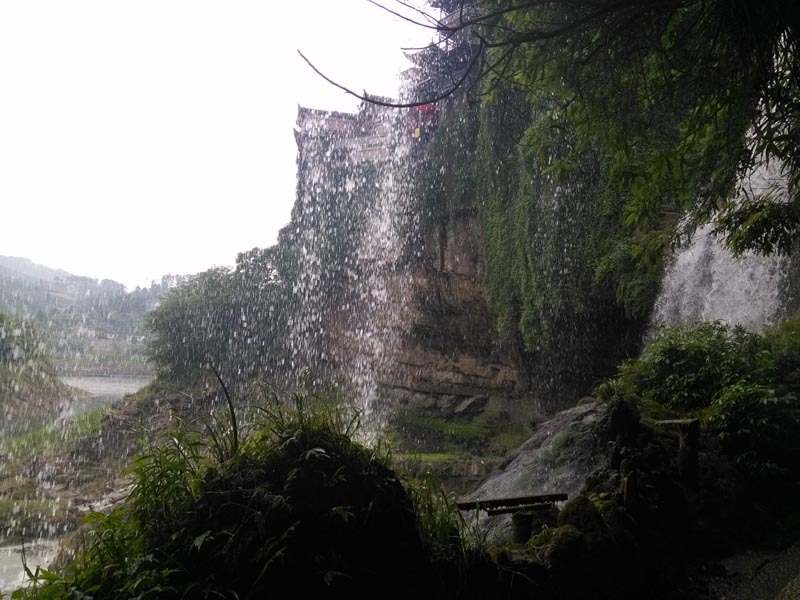 So, I would suggest you to depart from the central-located Guilin Railway Station for Liuzhou, which usually take about 70 minutes and cost from CNY 45.5 in a 2nd class seat. 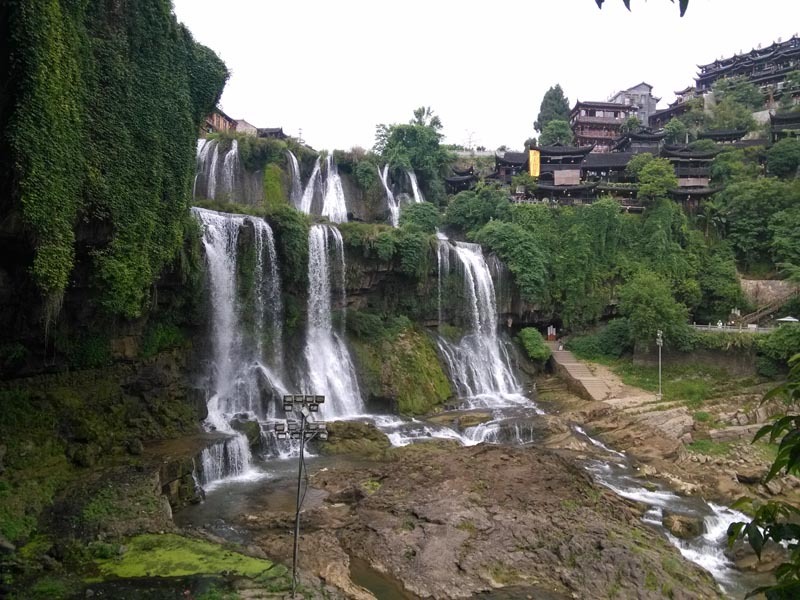 Be noted: When arriving at Liuzhou Railway Station, you will have to move to Liujiang Railway Station (柳江站) by taxi in 20 – 30mins, where to catch your night train to Jishou for Fenghuang, or Zhangjiajie directly. 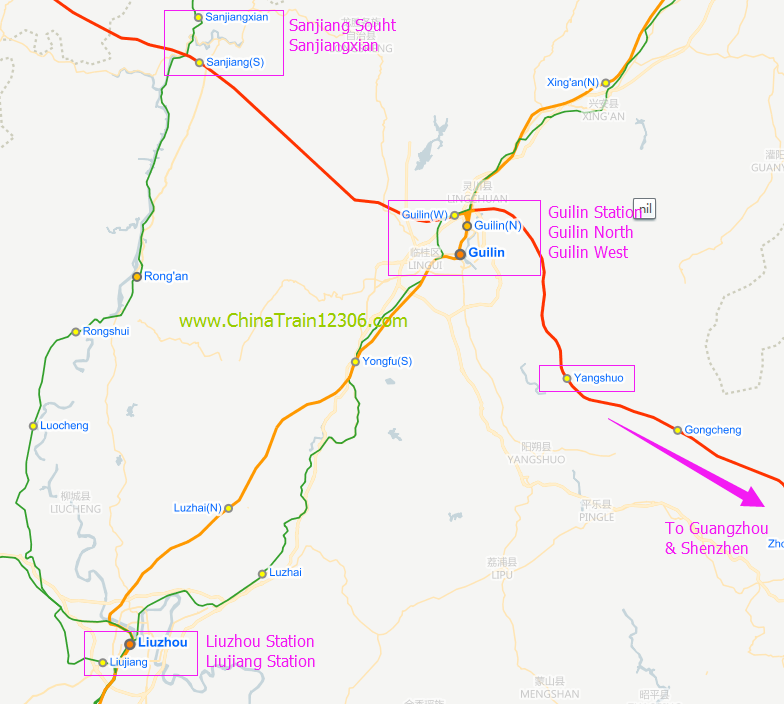 Over 20 bullet trains run from Guilin West, Guilin North or Guilin Railway Station to Sanjiang South, the high speed train station at Sanjiang County. 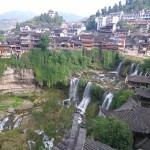 For more information, please refer to the page: Guilin to Sanjiang train. 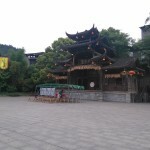 Liuzhou has two train stations for passenger service: Liuzhou Railway Station and Liujiang Railway Station. Liuzhou Railway Station is the main station handling all high speed trains and most normal slow trains, and Liujiang Railway Station is just a small station temporarily used by several slow night trains. 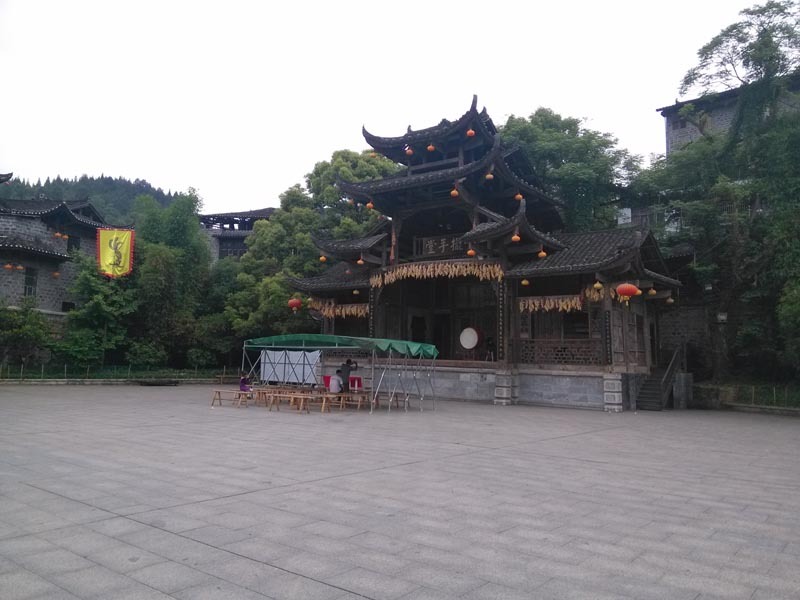 Your trains to or from Jishou (for Fenghuang) and Zhangjiajie are now using Liujiang Railway Station.You can travel between Liuzhou Train Station and Liujiang Railway Station by a taxi. There are about 2-3 night trains running from Liuzhou’s Liujiang Railway Station to Jishou Railway Station (吉首站) using K and T type trains. Journey time is from 8.5 hours to 9.5 hours and ticket fare is fairly cheap, about CNY 133 in a hard sleeper. 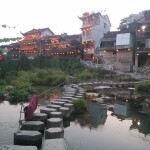 Your night train will arrive at Jishou Railway Station the next morning, from where you can go to Jishou North Bus Station to catch a bus to Fenghuang. 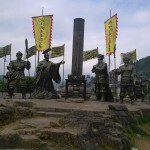 Just turn left when exitting from Jishou Railway Station and walk about 100 meters to get to Jishou North Bus Station. 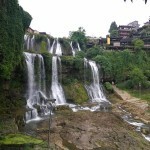 The buses run frequently from Jishou to Fenghuang. 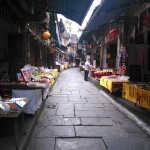 (See page: Jishou to Fenghuang bus). Jishou North Bus Station is about 100m away left beside Jishou Train Station, and the bus to Fenghuang run frequently and usually depart when full. 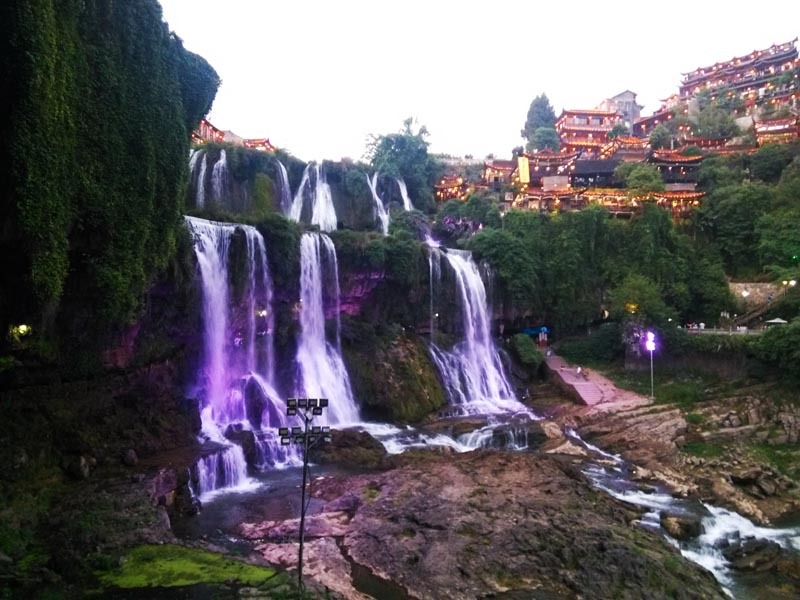 There are direct night trains linking Liuzhou with the famous tourist destination Zhangjiajie using Liujiang Railway Station in Liuzhou and Zhangjiajie Railway Station, the main train station in Zhangjiajie. Travel time is from 10.5 hoursto 11.5 hours, deparing at night and arriving in the morning & saving you a hotel bill with a sleeper. Ticket price is CNY 158 for a hard sleeper. 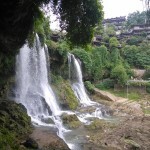 If you arrive Liuzhou at Liujiang Railway Station, you will have to transfer to Liuzhou Railway Station to catch a high speed train to Guilin, arriving at the centrally-located Guilin Railway Station or the Guilin North Railway Station in subsurb, where you can catch bullet trains to Guangzhou South or Shenzhen North Station. 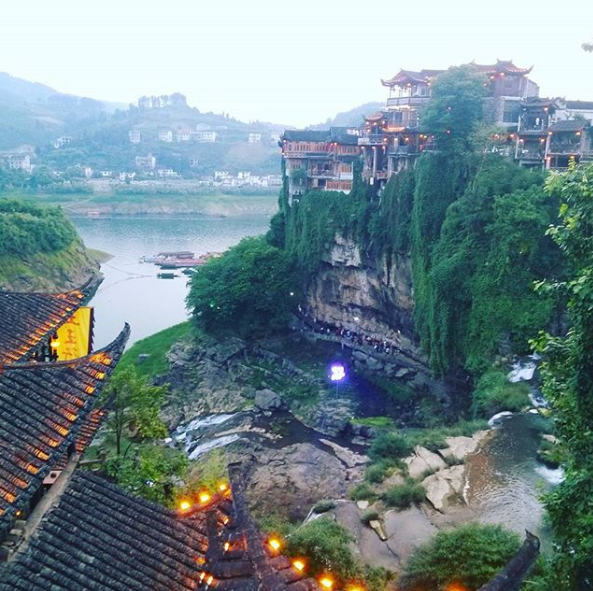 The bullet trains to Guilin run 50 times a day from Liuzhou Railway Station, journey time about 1 hour. 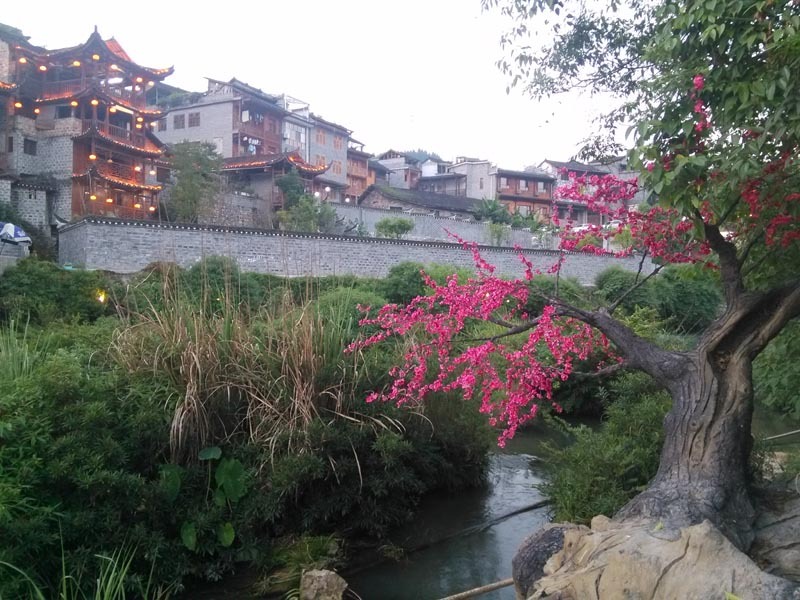 Fenghuang has no train staton. 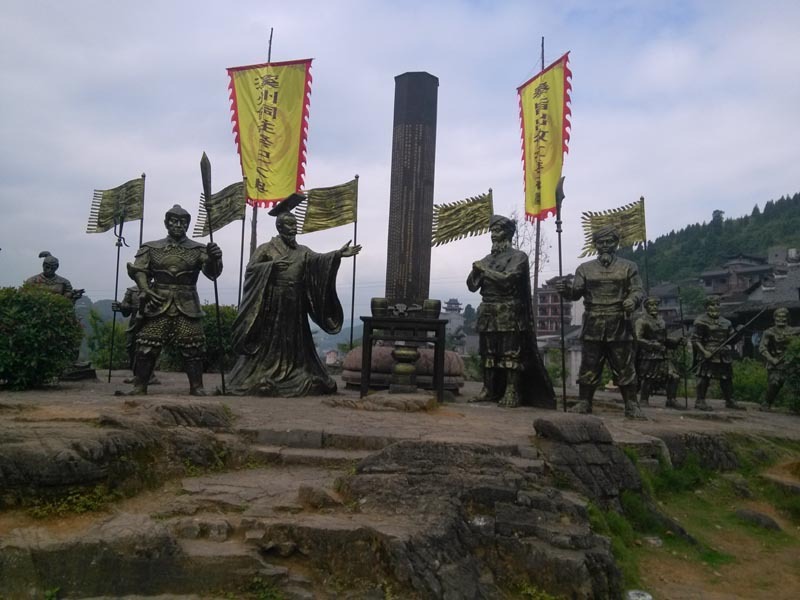 It can be only accessable by bus, and the most frequently used bus station in Fenghuang is called Fenghuang North Bus Station (Chengbei Bus Station), where most buses to or from Jishou, Huaihua or Changsha stop here. 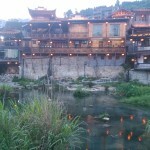 See Fenghuang by bus page for more information. 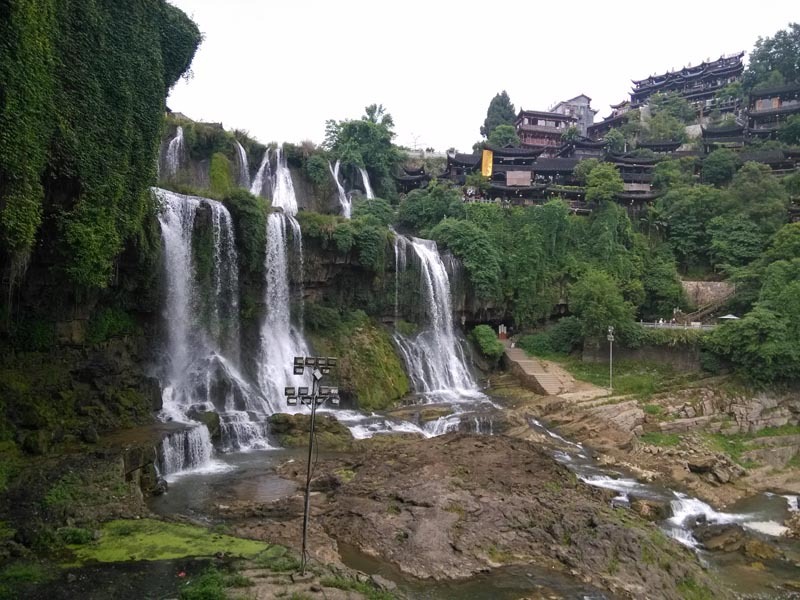 Travel from Fenghuang to Zhangjiajie, Furong Town (Wangcun), Liuzhou or Guilin, you will have to make a transfer by bus at Jishou Railway Station. 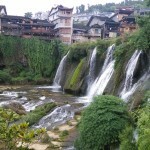 You have two options to travel from Fenghuang to Zhangjiajie: by direct bus OR by bus + train via Jishou. 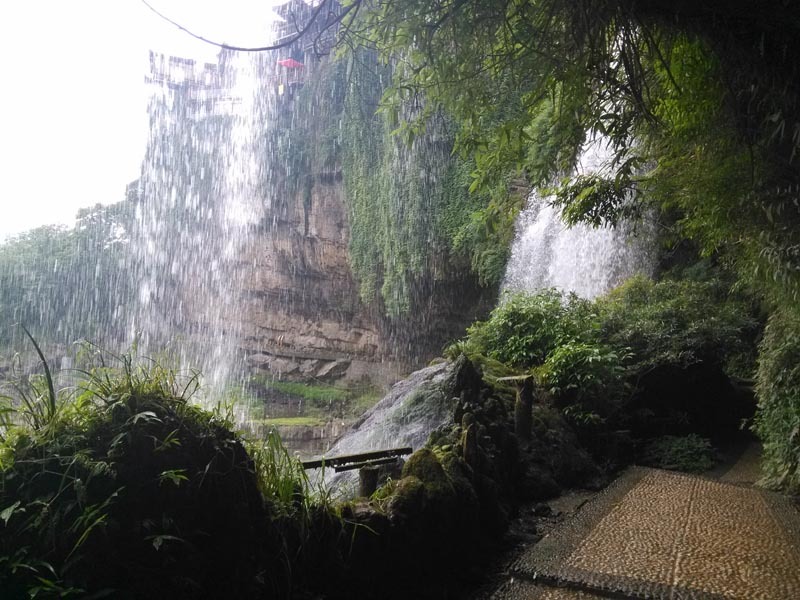 There are about 6 daily buses running from Fenghuang to Zhangjiajie Central Bus Station, which locates beside Zhangjiajie Train Station, and 2 buses running to Wulingyuan Bus Station, which is near the Forest Park. 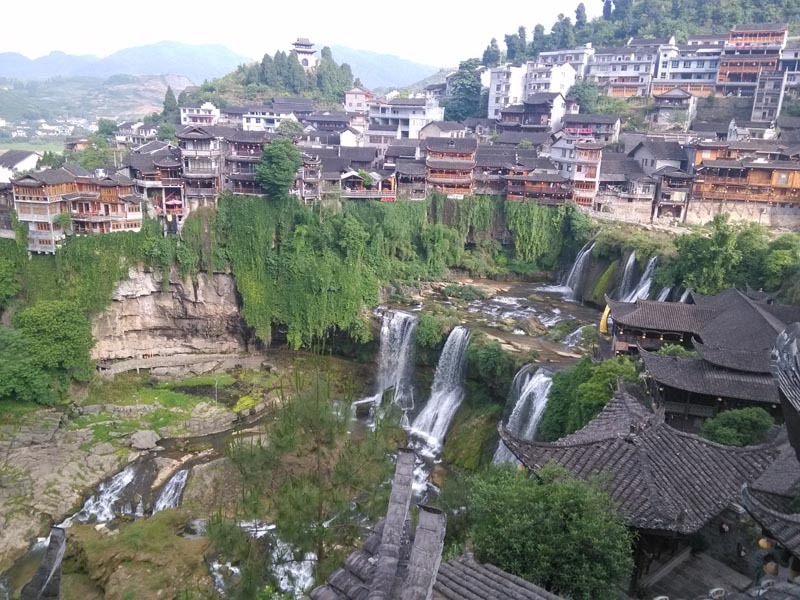 Both routes pass through Furong Town,From Fenghuang to Zhangjiajie Central Bus Station, the buses take 4-4.5 hours to cover the 210km journey, and cost CNY70. 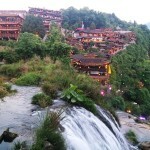 From Fenghuang to Wulingyuan, the buses take 4.5-5 hours, and cost CNY80. 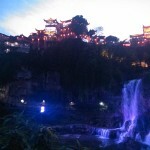 First, take one of the frequently bus service from Fenghuang to Jishou North Bus Station, CNY23 and 1 hour. 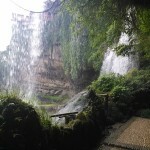 Then walk 100 meters to Jishou Railway Station to catch a train to Zhangjiajie Railway Station. 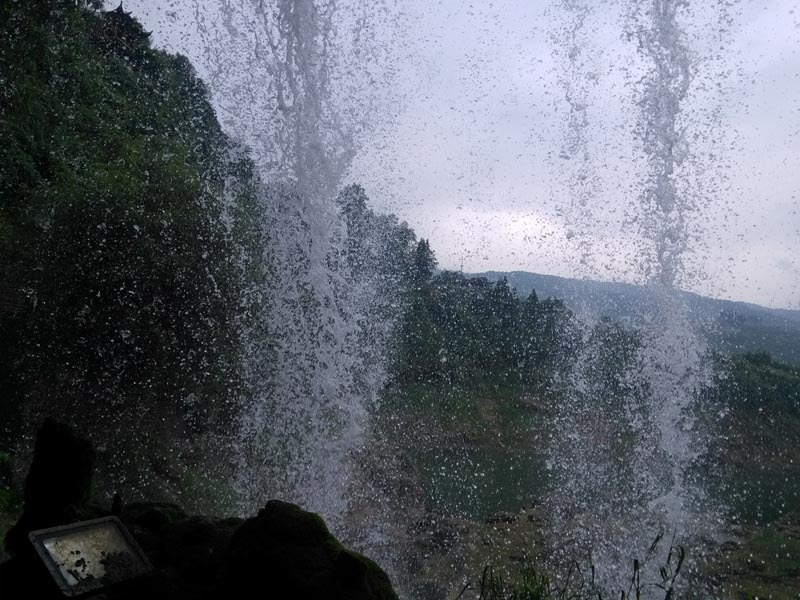 There are 12 T or K type slow trains running from Jishou Railway Station to Zhangjiajie Railway Station, taking about 2 hours and costing CNY19.5 for a hard seat. 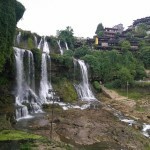 I did this rail journey from Guilin to Fenghuang and Zhangjiajie via Liuzhou about 8 years ago with my friends (June, 2009) when I was a student in Guilin University of Electronic and Technology. 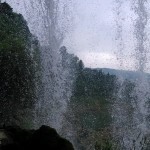 However, the train ride (Liuzhou to Jishou) did not leave me a good memory as the tickets for sleeper sold out quickly. We had only tickets for hard seats, and had to sit in the hard seats for nearly 9 hours, in a coach that was full of passengers with no airconditioner but only electric fans. But I found things get improved when I did this rail journey once again in my recent trip (Guilin – Liuzhou – Jishou – Fenghuang – Furong Town) in May of 2017. The night train was air-conditioned and not that crowed, and the night train ride was much of fun. I slept on a upper berth in a hard sleeper coach.